If you’re looking for peace and quiet without leaving city limits then this retreat is ideal for you. Pristine and doused in welcome silence, The Gnostic Centre is the place to head to clear your system of stress. The Gnostic Centre was set up as a not-for-profit trust by a small group of professionals in 1996 to honour the work and vision of Sri Aurobindo and The Mother. Apart from a day trip to absorb the peace, you can also enroll in the various sessions they hold regularly. From business retreats to deal with work stress and team building to conscious learning sessions that are more about holistic living practices, it depends entirely on your choice. Quietude, the guest living space is a bungalow with 10 single rooms. 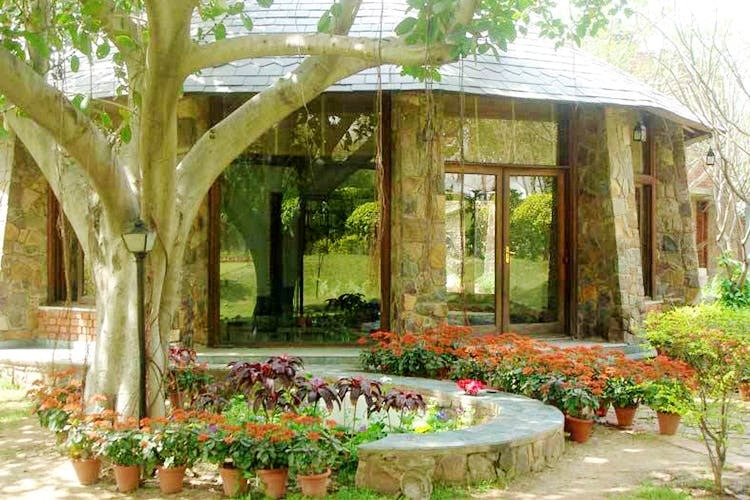 Set amidst rolling lawns and lily-filled ponds on either side, the ambience here is the essence of the retreat. They have wi-fi which allows guests to work while they relax and they can commune at the community space which is the pantry. Alchemy, the fitness studio is where you can go for yoga sessions and they have sports facilities too, so enjoy a game of badminton or table tennis. They have activities for kids which includes river crossing, rappelling, Indian folk and street games. Their café, Alchemy Café, is where you can get organic jams and preserves, cow ghee and a bunch of other products that are all pesticide-free. For corporate guests, they also have a conference room facility and a meditation shrine to leave your stress behind.